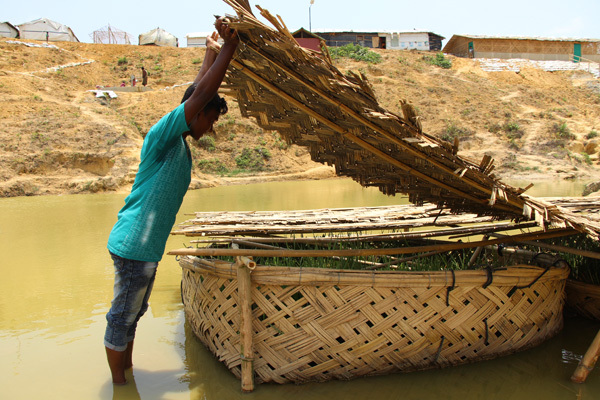 COX'S BAZAR, Bangladesh, May 18 2018 - Over two million vetiver grass plants have been distributed by IOM, the UN Migration Agency, in the past two weeks to reduce soil erosion and the risk of landslides in southern Bangladesh’s Rohingya refugee camps, where hundreds of thousands of people are at risk from impending monsoon rains. A further two million plants will be given to local and international NGOs for distribution before the end of May, following the initial success of the project, which has local vetiver suppliers struggling to keep up with demand. The grass costs just over USD 1.50 for a bundle of 200 plants. But the project, which in total could help stabilize land equivalent to almost 150 football fields, is expected to have a significant impact on improving living conditions in the hillside camps and will help to prevent life-threatening soil erosion. Violence in Myanmar has sent almost 700,000 people fleeing over the border into Cox’s Bazar, Bangladesh, since last August. The new arrivals, desperate for space to build shelters for their families, cleared the vegetation from vast swathes of the region, leaving them living on bare, sandy slopes extremely vulnerable to landslides during the monsoon and cyclone seasons. Around 200,000 people have been recognised as being at high risk from landslides and floods in the coming monsoon months, and the entire refugee population is extremely vulnerable to related dangers, including restricted access to vital services and waterborne diseases. While grass alone is not sufficient to stabilize the steepest slopes, the vetiver plants offer an opportunity to protect large areas of the camps from erosion. As well as providing a grass delivery pipeline for partner agencies across the camps, IOM has directly planted 2,750 bundlesthrough cash for work programmes with Rohingya refugees and members of local host communities. IOM has also produced a series of simple illustrations to help the refugees, many of whom are illiterate, to understand how best to plant and care for the plants. “We drew on Bangladesh University of Engineering and Technology studies to learn lessons from other projects involving vetiver grass and apply them here. The illustrations helped share that knowledge with people in a very practical way,” said IOM Site Development Coordinator Megan Genat. The newly planted vetiver requires watering twice a day and community volunteers, participants in cash for work projects, and individual refugee families have all been enthusiastically caring for the freshly planted grass in different parts of the camps. “It’s been really encouraging to see everyone getting involved. The project has also helped in raising public awareness of the risks of soil erosion. We will be following up with a fuller analysis of the impact next month, but initial reports from our partners indicate it has been going very well and is proving popular with the refugee community,” added Genat. The Cox’s Bazar district, which is now sheltering almost a million Rohingya refugees, is prone to some of the heaviest monsoon conditions in the entire country, and is also vulnerable to cyclones from the Bay of Bengal. The monsoon proper is due to hit next month, but early rains and storms have already damaged scores of shelters and caused several small landslides in the camps. The vetiver project is one of a wide range of practical initiatives that IOM site management teams are working on to help safeguard people and improve living conditions ahead of the monsoon. “Across the camps we are constructing roads and access routes, improving drainage, building bridges, and preparing ground before the rains hit. We are also working with other agencies and the Bangladesh authorities to support resilience and disaster preparedness training for refugees and the host community, so we can all be ready to respond to emergencies when they occur,” said Manuel Pereira, IOM’s Emergency Coordinator in Cox’s Bazar. But he warned that with early rains and storm already causing damage in the camps and the full monsoon due to start next month, urgent funding is required to allow more to be done to protect the Rohingya refugees. Less than a quarter of IOM’s USD 182 million appeal to support the refugees through year end has been secured. “From medical staff to engineers, IOM teams are working round the clock to save lives in the camps and protect people as much as possible ahead of monsoon. If we have to delay projects, lives will be lost. We need funding now to be able to act before disaster strikes,” said Pereira.